Southern Peony: 2014 Swenson Gardens 7 Intersectional Peonies for $35! 2014 Swenson Gardens 7 Intersectional Peonies for $35! Wow! 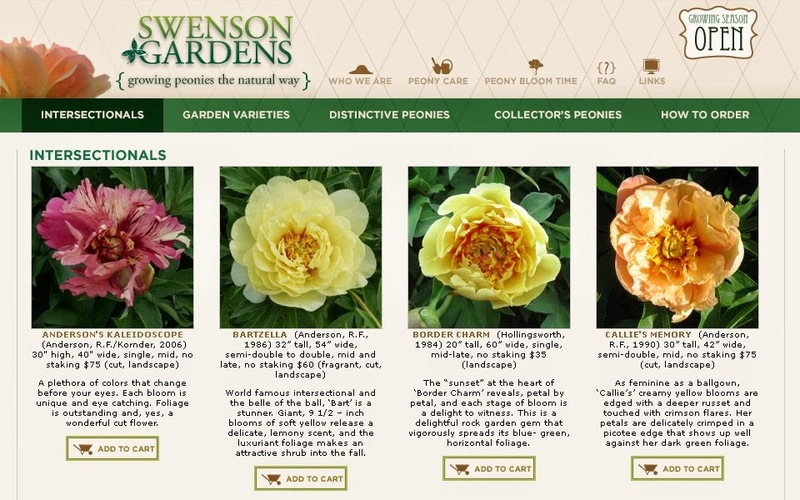 Swenson Gardens finally released their 2014 peony catalog online, and I've updated my post with the all of the prices for the 2014 Intersectional Peony Catalog Price Comparisons List. I must say they have really lowered their prices on the majority of their intersectional peonies. Since they usually offer one of the largest selections of intersectional peonies, this is really big news! Also they are offering 7 different intersectional peony varieties for $35.00 each! This is an almost unheard of price point for an intersectional peony, and they are offering lots to choose from at that price! It seems as if Swenson Gardens is trying to be the leader in intersectional peonies in price and selection. They also have 6 other intersectional peonies in the $40-$50 range. So if you are looking to expand your intersectional peony collection or maybe just start your collection, 2014 seems to be a great year to do so! 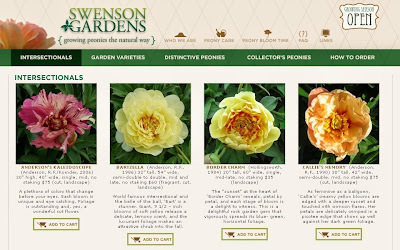 The intersectional peony varieties that Swenson Gardens is offering for $35 are: 'Border Charm', 'Japanese Itoh', 'Old Rose Dandy', 'Pastel Splendor', 'Prairie Charm', 'Scarlet Heaven', and 'Shining Light'. One of these peonies, Peony 'Prairie Charm', is even an American Peony Society Award of Landscape Merit award winning peony! Swenson Gardens Offers 7 Intersectional Peonies for $35! I believe itoh peonies should be cheaper than tree peonies if they can also be grafted or even produced from 1 bud by rooting them. Yes, I've succeeded in both, but they are easily propagated.